Marionberries are a type of blackberry from Oregon. Marionberries fruit on primocanes, which grow for two years. The primocanes start growing during the warm season of the first year, survive fall and winter and then grow and produce berries during spring and summer of the next year. After producing berries, the canes die, and new primocanes grow to produce berries during the following year. Be careful to prune old primocanes and not new ones, or a marionberry plant will miss out on a year of fruit production. 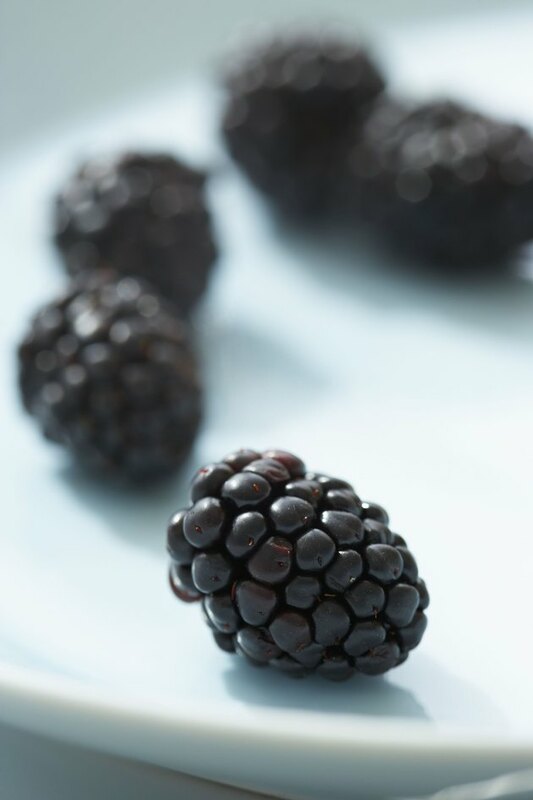 Marionberries are a type of thorny blackberries. Prune off dead and damaged roots when planting a new marionberry. Before placing a new plant in the planting hole, shake excess soil off of the roots and look for damage. Cut off any broken pieces or dark and rotten sections, leaving only healthy off-white roots behind. Untangle or sort out marionberry canes after the plant produces fruit for the year. Identify the dying old canes that already fruited that year and new canes that will fruit next year. Identify old canes by looking for shriveling and dried up flowers where berries were picked from, because old canes start to shrivel and die after they fruit. Newer canes will have perkier leaves and will not have any old flowers. Prune old canes that already fruited down to the ground in late summer or early fall. Marionberries often fruit in June or July. Some fruit in August, depending on the area and the weather that year. Cut old canes to the soil line after harvesting the berries, usually sometime in July. Canes that have already fruited will not fruit again, and they will die off anyway. Pruning helps the plant focus its energy on growing healthy new canes. Prune off unwanted root suckers as they grow, leaving the largest and healthiest primocanes alone to produce fruit next year. Root suckers are new marionberry plants that begin to grow from the roots or base of existing marionberry plants. Look for very small shoots growing off of marionberry roots. Pruning root suckers keeps vines from spreading out of confined areas and it also helps the vines focus their energy on growing another crop of fruit rather than new plants.